NeuroAllergy Research Laboratory (NARL), School of Life and Environmental Sciences, Faculty of Science, Engineering and Built Environment, Waurn Ponds, Victoria, Australia. α-linolenic acid (ALA), docosahexaenoic acid (DHA) and eicosapentaenoic acid (EPA). DHA is considered as the main structural omega-3 fatty acid, which comprises about 40% of the PUFAs in total. DHA deficiency may be the cause of many disorders such as depression, inability to concentrate, excessive mood swings, anxiety, cardiovascular disease, type 2 diabetes, dry skin and so on. zinc is the most abundant trace metal in the human brain. excess amounts of free zinc, to cellular death. free zinc availability at cellular levels. omega-3 and zinc effect on neurodegeneration and cellular death. the importance of free zinc for human neuronal cells. significance for the diagnosis and treatment of neurodegeneration. thereby increase inflammatory processes . the reverse process can be seen with increased omega-3 fatty acids in the body. which are implicated in various health conditions, have been shown to be increased with high omega-6 fatty acids but decreased with omega-3 fatty acids in the human body. .Since omega-3 fatty acids are prevalent in the nervous system, it seems logical that a deficiency may result in neuronal problems, and this is indeed what has been identified and reported. Table 1. Total percentage of omega-3 fatty acids in common foods and supplements. Table adopted from Maclean C.H. et al. .
a protective effect of omega-3 fatty acids only among those with mild cognitive impairment conditions. an improvement with 900 mg of DHA. importance of free zinc to human neuronal cells. also in the testis and sperm. in the retina it is as high as 33%. in particular the well-developed brain. Premature babies fed on DHA-rich formula show improvements in vocabulary and motor performance. protective role of omega-3 fatty acids. an increase in DHA levels in the hippocampus. suggesting a role in antioxidant defense. of enzymes. The essential nature of zinc to the human body can be clearly displayed by studying the wide range of pathological effects of zinc deficiency. Anorexia, embryonic and post-natal growth retardation, alopecia, skin lesions, difficulties in wound healing, increased hemorrhage tendency and severe reproductive abnormalities, emotional instability, irritability and depression are just some of the detrimental effects of zinc deficiency. it inhibits excitatory and inhibitory receptors. its release is dependent on neural activity. Retardation of the growth and development of CNS tissues have been linked to low zinc levels. Peripheral neuropathy, spina bifida, hydrocephalus, anencephalus, epilepsy and Pick’s disease have been linked to zinc deficiency. However, the body cannot tolerate excessive amounts of zinc. high physiological levels of zinc. chelation of zinc ions can deform and disaggregate plaques. somatostatin-containing neurons in the forebrain. leaving neurons frequently exposed to high dosages of zinc. and up-regulating the cellular levels of reactive oxygen species (ROS). High levels of zinc are found in Alzheimer’s brains indicating a possible zinc related neurodegeneration. A study conducted with mouse neuronal cells has shown that even a 24-h exposure to high levels of zinc (40 μm) is sufficient to degenerate cells. redistribution of available zinc to more zinc dependent cells or organs. assessment of the zinc status of individuals and populations. These transporters are mainly categorized under two metal transporter families; Zip (ZRT, IRT like proteins) and CDF/ZnT (Cation Diffusion Facilitator), also known as SLC (Solute Linked Carrier) gene families: Zip (SLC-39) and ZnT (SLC-30). More than 20 zinc transporters have been identified and characterized over the last two decades (14 Zips and 8 ZnTs). Members of the SLC39 family have been identified as the putative facilitators of zinc influx into the cytosol, either from the extracellular environment or from intracellular compartments (Figure 1). Figure 1. 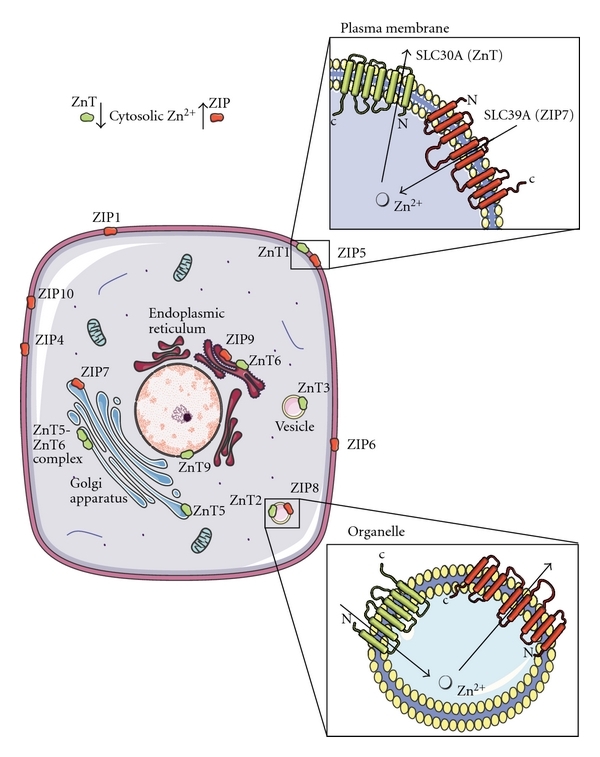 Putative cellular localization of some of the different human zinc transporters (i.e., Zip1- Zip4 and ZnT1- ZnT7). Arrows indicate the direction of zinc passage by the appropriate putative zinc transporters in a generalized human cell. Although there are fourteen Zips and eight ZnTs known so far, only the main zinc transporters are illustrated in this figure for clarity and brevity. Figure 2: Early zinc signaling (EZS) and late zinc signaling (LZS). 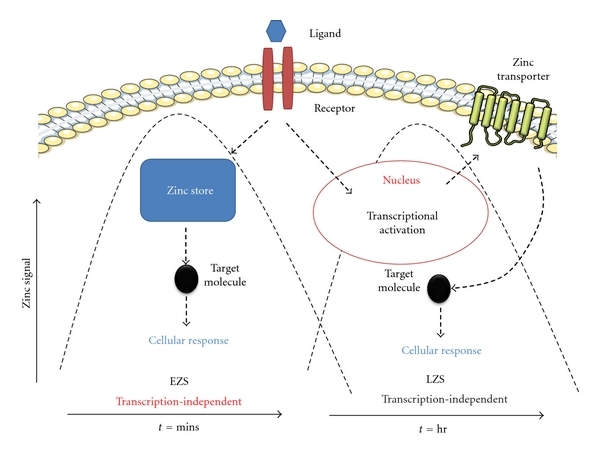 EZS involves transcription-independent mechanisms where an extracellular stimulus directly induces an increase in zinc levels within several minutes by releasing zinc from intracellular stores (e.g., endoplasmic reticulum). LSZ is induced several hours after an external stimulus and is dependent on transcriptional changes in zinc transporter expression. Components of this figure were produced using Servier Medical Art, http://www.servier.com/ and adapted from Fukada et al. .
elevated expression of the putative zinc transporter, ZnT3, in the rat brain. and the presence of insoluble amyloid were observed. thus indicating a possible link to AD. cognitive deficits in transgenic mouse model of AD. In addition, studies by Stoltenberg, Flinn and colleagues report on the modulation of zinc and the effect in transgenic mouse models of AD. Given that all of these are classic pathological features of AD, and considering the limiting nature of DHA in these processes, it can be argued that DHA is a key candidate in preventing or even curing this debilitating disease. In order to better understand the possible links and pathways of zinc and DHA with neurodegeneration, we designed a study that incorporates all three of these aspects, to study their effects at the cellular level. In this study, we were able to demonstrate a possible link between omega-3 fatty acid (DHA) concentration, zinc availability and zinc transporter expression levels in cultured human neuronal cells. that in turn inhibits apoptosis. high Bcl-2 levels compared to the control treatment. correlation between zinc, DHA and neurodegeneration. ZnT3 in memory and AD pathology. Results from these studies indicate a possible zinc-transporter-expression-level-dependent mechanism for DHA neuroprotection. Collectively from these studies, the following possible mechanism can be proposed (Figure 2). Figure 2. Proposed neuroprotection mechanism of docosahexaenoic acid (DHA) in reference to synaptic zinc. 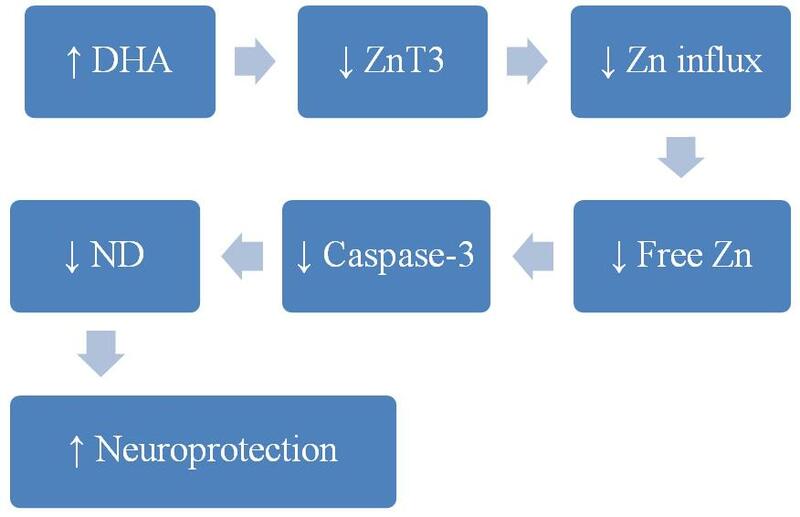 Schematic diagram showing possible benefits of DHA in neuroprotection through reduction of ZnT3 transporter expression levels in human neuronal cells, which results in a reduction of zinc flux and thus lowering zinc concentrations in neuronal synaptic vesicles, and therefore contributing to a lower incidence of neurodegenerative diseases (ND), such as Alzheimer’s disease (AD). More recent data from our research group have also shown a link between the expression levels of histone H3 and H4 proteins in human neuronal cells in relation to DHA and zinc. Following DHA treatment, both H3 and H4 levels were up-regulated. In contrast, zinc treatment resulted in a down-regulation of histone levels. Both zinc and DHA have shown opposing effects on histone post-translational modifications, indicating a possible distinctive epigenetic pattern. Upon treatment with zinc, M17 cells displayed an increase in histone deacetylase (HDACs) and a reduction in histone acetylation. Conversely, with DHA treatment, HDAC levels were significantly reduced and the acetylation of histones was up-regulated. These findings also support a possible interaction between DHA and zinc availability. It is possible to safely claim that there is more than one potential pathway by which DHA and zinc interact at a cellular level, at least in cultured human neuronal cells. Significance and importance of both DHA and zinc in neuronal survival is attested by the presence of these multiple mechanisms. Most of these reported studies were conducted using human neuroblastoma cells, or similar cell types, due to the lack of live mature human neuronal cells. Thus, the results may differ from results achieved under actual human physiological conditions due to the structural and functional differences between these cells and mature human neurons. Therefore, an alternative approach that can mimic the human neuronal cells more effectively would be advantageous. S1P is a 379Da member of the lysophospholipid family. It is the direct metabolite of sphingosine through the action of two sphingosine kinases, SphK1 and SphK2. The main metabolic pathway starts with the hydrolysis of sphingomyelin, a membrane sphingolipid, into ceramide by the enzyme sphingomyelinase and the subsequent production of sphingosine by ceramidase (Figure 1). Ceramide can also be produced de novo in the endoplasmic reticulum (ER) from serine and palmitoyl coenzyme A through multiple intermediates. S1P production is regulated by various S1P-specific and general lipid phosphatases, as well as S1P lyase, which irreversibly degrades S1P into phosphoethanolamine and hexadecanal. The balance between intracellular S1P and its metabolite ceramide can determine cellular fate. Ceramide promotes apoptosis, while S1P suppresses cell death and promotes cell survival. This creates an S1P ceramide “rheostat” inside the cells. S1P lyase expression in tissue is higher than it is in erythrocytes and platelets, the main “suppliers” of S1P in blood. This causes a tissue–blood gradient of S1P, which is important in many S1P-mediated responses, like the lymphocyte egress from lymphoid organs. extracellular S1P signaling through those receptors. There are five receptors that have been identified currently. These can be coupled with different G-proteins. Assuming that each receptor coupling with a G protein has a slightly different function, one can recognize the complexity of S1P receptor signaling. cell “rheostat” between S1P and its precursor ceramide. Important evidence that S1P can act intracellularly as a second messenger came from yeast (Saccharomyces cerevisiae) and plant (Arabidopsis thaliana) cells. Yeast cells do not express any S1P receptors, although they can be affected by S1P during heat-shock responses. Similarly, Arabidopsis has only one GPCR-like protein, termed “GCR1,” which does not bind S1P, although S1P regulates stomata closure during drought. disruption of mitochondrial respiration and cytochrome c oxidase function. inhibiting their activity, thus having an indirect effect in epigenetic regulation of gene expression. In the ER, SphK2 has been identified to translocate during stress, and promote apoptosis. It seems that S1P has specific targets in the ER that cause apoptosis, probably through calcium mobilization signals. through its interaction with molecules in different compartments of the cell. It can also exist at high concentrations extracellularly, in the blood plasma and lymph. This causes an S1P gradient important for cell migration. S1P signals through five G protein-coupled receptors, S1PR1–S1PR5, whose expression varies in different types of cells and tissue. S1P signaling can be involved in physiological and pathophysiological conditions of the cardiovascular, nervous, and immune systems and diseases such as ischemia/reperfusion injury, autoimmunity, and cancer. In this review, we discuss how it can be used to discover novel therapeutic targets. In a mouse model of myocardial ischemia-reperfusion injury (IRI), S1P and its carrier, HDL, can help protect myocardial tissue and decrease the infarct size. It seems they reduce cardiomyocyte apoptosis and neutrophil recruitment to the ischemic tissue and may decrease leukocyte adhesion to the endothelium. This effect appears to be S1PR3 mediated, since in S1PR3 knockout mice it is alleviated. Ischemia activates SphK1, which is then translocated to the plasma membrane. This leads to an increase of intracellular S1P, helping to promote cardiomyocyte survival against apoptosis, induced by ceramide. SphK1 knockout mice cannot be preconditioned against IRI, whereas SphK1 gene induction in the heart protects it from IRI. Interestingly, a recent study shows SphK2 may also play a role, since its knockout reduces the cardioprotective effects of preconditioning. Further, administration of S1P or sphingosine during reperfusion results in better recovery and attenuation of damage to cardiomyocytes. As with preconditioning, SphK1 deficiency also affects post-conditioning of mouse hearts after ischemia reperfusion (IR). S1P does not only protect the heart from IRI. During intestinal IR, multiple organs can be damaged, including the lungs. S1P treatment of mice during intestinal IR seems to have a protective effect on lung injury, probably due to suppression of iNOS-induced nitric oxide generation. In renal IRI, SphK1 seems to be important, since its deficiency increased the damage in kidney tissue, whereas the lentiviral overexpression of the SphK1 gene protected from injury. Another study suggests that, after IRI, apoptotic renal cells release S1P, which recruits macrophages through S1PR3 activation and might contribute to kidney regeneration and restoration of renal epithelium. However, SphK2 is negatively implicated in hepatic IRI, its inhibition helping protect hepatocytes and restoring mitochondrial function. Further studies are implicating S1P signaling or sphingosine kinases in several kinds of cancer as well as autoimmune diseases. Figure 2 FTY720-P causes retention of T cells in the lymph nodes. Fingolimod (INN, trade name Gilenya, Novartis) is an immunomodulating drug, approved for treating multiple sclerosis. It has reduced the rate of relapses in relapsing-remitting multiple sclerosis by over half. Fingolimod is a sphingosine-1-phosphate receptor modulator, which sequesters lymphocytes in lymph nodes, preventing them from contributing to an autoimmune reaction. The S1P antagonist FTY720 has been approved by the US Food and Drug Administration to be used as a drug against multiple sclerosis (MS). FTY720 is in fact a prodrug, since it is phosphorylated in vivo by SphK2 into FTY720-P, an S1P structural analog, which can activate S1PR1, 3, 4, and 5. FTY720-P binding to S1PR1 causes internalization of the receptor, as does S1P – but instead of recycling it back to the cell surface, it promotes its ubiquitination and degradation at the proteasome. This has a direct effect on lymphocyte trafficking through the lymph nodes, since it relies on S1PR1 signaling and S1P gradient (Figure 2). In MS, it stops migrating lymphocytes into the brain, but it may also have direct effects on the CNS through neuroprotection. FTY720 can pass the blood–brain barrier and it could be phosphorylated by local sphingosine kinases to act through S1PR1 and S1PR3 receptors that are mainly expressed in the CNS. In MS lesions, astrocytes upregulate those two receptors and it has been shown that FTY720-P treatment in vitro inhibits astrocyte production of inflammatory cytokines. A recent study confirms the importance of S1PR3 signaling on activated astrocytes, as well as SphK1, that are upregulated and promote the secretion of the potentially neuroprotective cytokine CXCL-1. There are several studies implicating the intracellular S1P ceramide rheostat to cancer cell survival or apoptosis and resistance to chemotherapy or irradiation in vitro. Studies with SphK1 inhibition in pancreatic, prostate cancers, and leukemia, show increased ceramide/S1P ratio and induction of apoptosis. However, S1P receptor signaling plays conflicting roles in cancer cell migration and metastasis. S1P signaling can be involved in many pathophysiological conditions. This means that we could look for therapeutic targets in all the molecules taking part in S1P signaling and production, most importantly the S1P receptors and the sphingosine kinases. S1P agonists and antagonists could also be used to modulate S1P signaling during pathological conditions. S1P can have direct effects on the cardiovascular system. During IRI, intracellular S1P can protect the cardiomyocytes and promote their survival. Pre- or post-conditioning of the heart with S1P could be used as a treatment, but upregulation of sphingosine kinases could also increase intracellular S1P bioavailability. S1P could also have effects on endothelial cells and neutrophil trafficking. Vascular endothelial cells mainly express S1PR1 and S1PR3; only a few types express S1PR2. S1PR1 and S1PR3 activation on these cells has been shown to enhance their chemotactic migration, probably through direct phosphorylation of S1PR1 by Akt, in a phosphatidylinositol 3-kinase and Rac1-dependent signaling pathway. Moreover, it stimulates endothelial cell proliferation through an ERK pathway. S1PR2 activation, however, inhibits endothelial cell migration, morphogenesis, and angiogenesis, most likely through Rho-dependent inhibition of Rac signaling pathway, as Inoki et al showed in mouse cells with the use of S1PR1 and S1PR3 specific antagonists. Regarding permeability of the vascular endothelium and endothelial barrier integrity, S1P receptors can have different effects. S1PR1 activation enhances endothelial barrier integrity by stimulation of cellular adhesion and upregulation of adhesion molecules. However, S1PR2 and S1PR3 have been shown to have barrier-disrupting effects in vitro, and vascular permeability increasing effects in vivo. All the effects S1P can have on vascular endothelium and smooth muscle cells suggest that activation of S1PR2, not S1PR1 and S1PR3, signaling, perhaps with the use of S1PR2 specific agonists, could be used therapeutically to inhibit angiogenesis and disrupt vasculature, suppressing tumor growth and progression. An important aspect of S1P signaling that is being already therapeutically targeted, but could be further investigated, is immune cell trafficking. Attempts have already been made to regulate lymphocyte cell migration with the use of the drug FTY720, whose phosphorylated form can inhibit the cells S1PR1-dependent egress from the lymph nodes, causing lymphopenia. FTY720 is used as an immunosuppressant for MS but is also being investigated for other autoimmune conditions and for transplantation. Unfortunately, Phase II and III clinical trials for the prevention of kidney graft rejection have not shown an advantage over standard therapies. Moreover, FTY720 can have some adverse cardiac effects, such as bradycardia. However, there are other S1PR1 antagonists that could be considered instead, including KRP-203, AUY954, and SEW2871. KRP-203 in particular has been shown to prolong rat skin and heart allograft survival and attenuate chronic rejection without causing bradycardia, especially when combined with other immunomodulators. There are studies that argue S1P pretreatment has a negative effect on neutrophil chemotaxis toward the chemokine CXCL-8 (interleukin-8) or the potent chemoattractant formyl-methionyl-leucyl-phenylalanine. S1P pretreatment might also inhibit trans-endothelial migration of neutrophils, without affecting their adhesion to the endothelium. S1P effects on neutrophil migration toward CXCL-8 might be the result of S1PRs cross-linking with the CXCL-8 receptors in neutrophils, CXCR-1 and CXCR-2. Indeed, there is evidence suggesting S1PR4 and S1PR3 form heterodimers with CXCR-1 in neutrophils. Another indication that S1P plays a role in neutrophil trafficking is a recent paper on S1P lyase deficiency, a deficiency that impairs neutrophil migration from blood to tissue in knockout mice. S1P lyase and S1PRs in neutrophils may be new therapeutic targets against IRI and inflammatory conditions in general. Consistent with these results, another study has shown that inhibition of S1P lyase can have a protective effect on the heart after IRI and this effect is alleviated when pretreated with an S1PR1 and S1PR3 antagonist. Inhibition was achieved with a US Food and Drug Administration-approved food additive, 2-acetyl-4-tetrahydroxybutylimidazole, providing a possible new drug perspective. Another S1P lyase inhibitor, LX2931, a synthetic analog of 2-acetyl-4-tetrahydroxybutylimidazole, has been shown to cause peripheral lymphopenia when administered in mice, providing a potential treatment for autoimmune diseases and prevention of graft rejection in transplantation. This molecule is currently under Phase II clinical trials in rheumatoid arthritis patients. S1P signaling research has the potential to discover novel therapeutic targets. S1P signaling is involved in many physiological and pathological processes. However, the complexity of S1P signaling makes it necessary to consider every possible pathway, either through its GPCRs, or intracellularly, with S1P as a second messenger. Where the activation of one S1P receptor may lead to the desired outcome, the simultaneous activation of another S1P receptor may lead to the opposite outcome. Thus, if we are to target a specific signaling pathway, we might need specific agonists for S1P receptors to activate one S1P receptor pathway, while, at the same time, we might need to inhibit another through S1P receptor antagonists. controls the expression and coordinated induction of a battery of defensive genes encoding detoxifying enzymes and antioxidant proteins. Cul3/Rbx1 mediated degradation of Nrf2. to switch on nuclear import of Nrf2. switching off of Nrf2 activation of gene expression. The switching on and off of Nrf2 protects cells against free radical damage, prevents apoptosis and promotes cell survival. Excessive proliferation of vascular smooth cells (VSMCs) plays a critical role in the pathogenesis of diverse vascular disorders, and inhibition of VSMCs proliferation has been proved to be beneficial to these diseases. siNPRA attenuated the inhibitory effects of BNP in VSMCs. the suppression of ROS production. These results might be related, at least partly, to the anti-oxidant property of BNP. Neuritogenesis is a complex morphological phenomena accompanying neuronal differentiation. Neuritogenesis relies on the initial breakage of the rather spherical symmetry of neuroblasts and the formation of buds emerging from the postmitotic neuronal soma. Buds then evolve into neurites, which later convert into an axon or dendrites. At the distal tip of neurites, the growth cone integrates extracellular signals and guides the neurite to its target. The acquisition of neuronal polarity depends on deep modifications of the neuroblast cytoskeleton characterized by the remodeling and activation of focal adhesions (FAs) and localized destabilization of the actin network in the neuronal sphere.Actin instability in unpolarized neurons allows neurite sprouting, ie, the protrusion of microtubules, and subsequent neurite outgrowth. Once the neurite is formed, actin microfilaments recover their stability and exert a sheathed action on neurites, a dynamic process necessary for the maintenance and integrity of neurites. A combination of extrinsic and intrinsic cues pilots the architectural and functional changes in FAs and the actin network along neuritogenesis. This process includes neurotrophic factors (nerve growth factor, brain derived neurotrophic factor, neurotrophin, ciliary neurotrophic factor, glial derived neurotrophic factor) and their receptors, protein components of the extracellular matrix (ECM) (laminin, vitronectin, fibronectin), plasma membrane integrins and neural cell adhesion molecules (NCAM), and intracellular molecular protagonists such as small G proteins (RhoA, Rac, Cdc42) and their downstream targets. (3) the stability and plasticity of neuronal polarity. which are involved in actin turnover and the dynamics of FAs. has emerged as a central player in neuritogenesis. to promote neurite sprouting, outgrowth, and maintenance. a facilitator role towards neurite elongation. soluble factors that control actin cytoskeleton turnover through Rho-GTPase signaling. takes part in the maintenance of neurites. neurites and the extracellular matrix.